I received complimentary products in exchange for an unbiased review. Made from 100% whitefish skins (nothing else), these natural low calorie treats have a rough texture which helps remove tartar from dog’s teeth. A nutritious complete wet food for dogs made with 60% Venison, pure vegetables and fruits, milled flaxseed, seaweed, Omega 3 rich salmon oil, herbs, plus all the essential vitamins and minerals your pet needs for a truly healthy and nutritious diet. As with all our treats we only use pure ingredients: no rendered animal parts, carcass or derivatives, no GM, no artificial preservatives, no colourants, no taste enhancers or sweeteners. No grains (not even rice!). We only use wholesome fruits and vegetables – the proof…. you can see the carrots, green beans and blueberries. The result is a delicious and nutritious meal for your dog. I first discovered Billy + Margot at a large dog show in Kent back in 2012. The dogs we had then, Henry and Jessie, absolutely loved Billy + Margot's iced treats which are fruit based 'ice creams' for dogs. 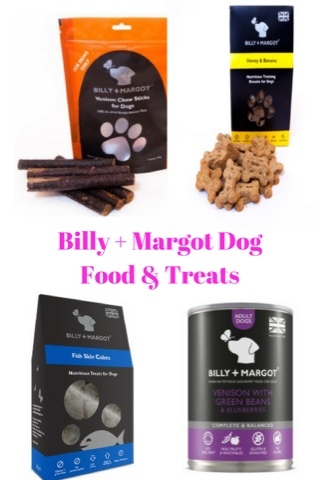 Billy + Margot now also make a wide range of natural dog treats as well as complete canned pet food. They kindly sent us a few of their products for Elgin and Cherry to try. The Honey and Banana training biscuits were very popular with Elgin and Cherry. They both have a sweet tooth, so these treats were a big hit. My brother's lurchers, Bandit and Skipper, also tried these biscuits and they both really liked them. Skipper is a fussy dog and he rarely likes non meaty treats, so I was very impressed that he liked these biscuits. 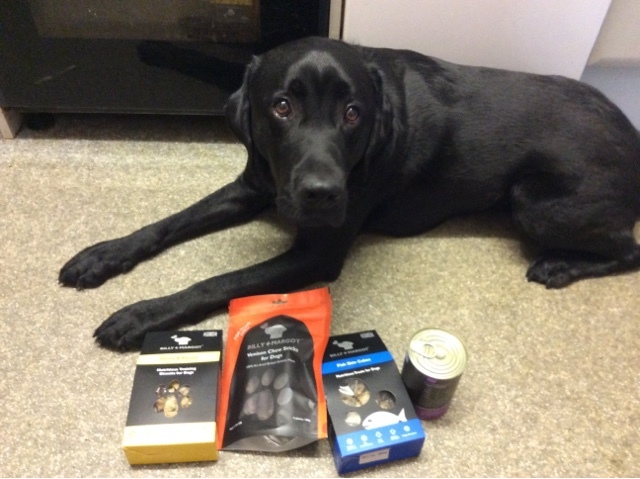 These treats are gluten free so are ideal for dogs with sensitivities. These honey and banana training biscuits were great for rewarding Elgin. Elgin tried the tin of complete wet food - he usually has dry food so he was very excited when he saw meat in his bowl! The flavour he tried was venison with carrots, green beans and blueberries. I must admit I'm not usually a fan of feeding tinned dog food, quite simply because the look and smell of it makes me feel queasy (one of my health problems makes me extra sensitive to strong smells)! But the Billy + Margot food looked completely different than other wet dog food I've used in the past. It smelt meaty, and it was a much more pleasant smell that than of more widely known tinned dog food. The meat looked a lot better too, you could tell it was of a very high quality just by it's appearance. You could even see the bits of vegetables and blueberries in the food. Elgin devoured this food very quickly - I don't think he's ever eaten his dinner this fast before! At £2.45 a tin to feed a dog of Elgin's size just on the tinned food it would work out a bit over my budget. But I would definitely buy it as an occasional treat to put with Elgin and Cherry's dry food and it is reasonably priced for a very high quality food. If you have a fussy dog, then I would suggest that you give Billy + Margot wet food a try as I really think that they'd like it. Elgin and Cherry trying the venison chew sticks. 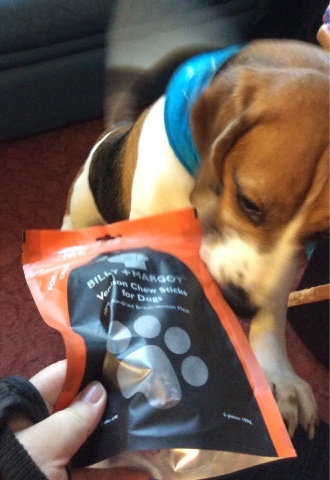 The venison chew sticks were definitely Elgin and Cherry's favourite Billy + Margot treats - I think they may even be their favourite treats ever. These meat sticks can be broken into smaller pieces if you wish, but I gave them to the dogs whole. Elgin and Cherry went absolutely crazy for the venison sticks, their little faces lit up whenever they saw the packet. The only thing I wasn't too keen on was the smell of the treats, but this is probably what made them appeal to the dogs so much, so it's not a problem. I think I'm definitely going to have to buy some more of these, as the dogs enjoyed them so much. Cherry was impatient to try the venison sticks! The fish skin cubes were also very popular with all of the dogs. My brother's deerhound, Bo, also loved these. He's fifteen and has lost sone strength in his jaw, so I wasn't sure if he'd be able to eat these crunchy treats - sometimes he decides harder treats aren't worth the effort to chew them - but he really enjoyed them and kept asking for more! 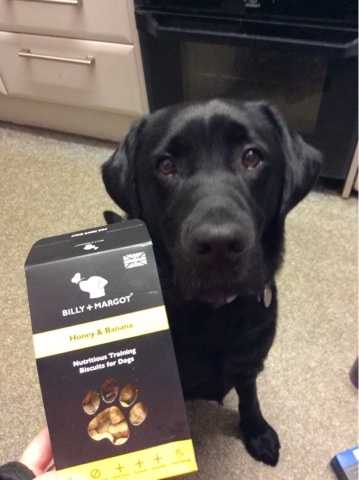 Billy + Margot are passionate about using high quality, nutritious ingredients in their products and this shines through in the quality of their treats and food. The treats are reasonably priced and are good value as they they are of such high quality, they are definitely worth the price and I would even pay a little bit more. Our dogs are now big fans of Billy + Margot - and so am I! I definitely recommend Billy + Margot to other dog owners, and I will be buying some more treats for Elgin and Cherry. Billy + Margot are best dog food and treatments. It really dog wheelchair work for dog disease. Positive site, where did u come up with the information on this posting?I have read a few of the articles on your website now, and I really like your style. Thanks a million and please keep up the effective work. Can Puppies Eat Tuna?